Night View NV Glasses turn fuzzy and dull into clear and bright, especially at night. Night View NV Glasses turn fuzzy and dull into clear and bright, especially at night. 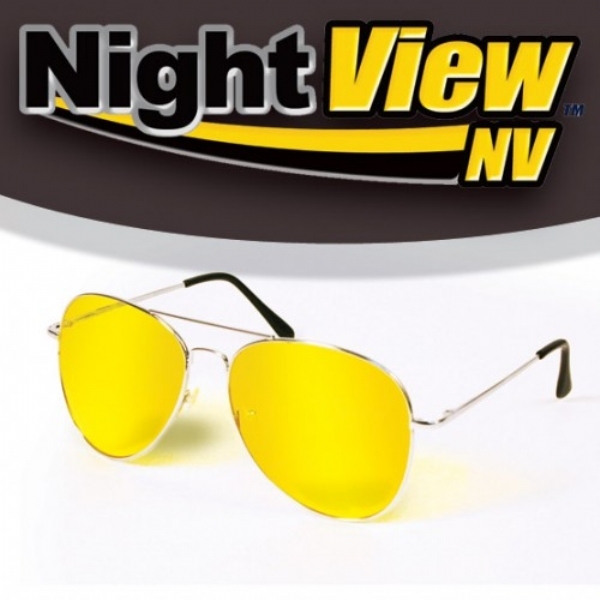 Night View NV Glasses cut down the glare from headlight and streetlight, reducing eye strain. The secret is the specially coated yellow lenses that block night time glare. Everything will look brighter and clearer. Stylish aviator frames. Night View Glasses as seen on TV provide protection form UVA and UVB rays. Perfect for day and night, cloudy or sunny. I have trouble seeing at night and these glasses really help me out! They really help me out with the glare. Yellow lenses are best for evening and nighttime viewing. These glasses work as advertise. Great for cloudy days, late afternoon and nighttime. They turn the blue sky white and enhance all colors. While driving at night they turn white light yellow. Can be worn all times except bright sunshine. Love using them for goldfing. Other amber hi def sunglasses cause me to lose the ball when near the ground. Only good with the sky as a background. Not as good as the old one they made ten years ago i could really see better at night m as maybe they will make a better NV sunglasses to see better at night like the older one that really did make it look more light at night. I like the NV glasses. They have really helped me at night. I can drive much easier without the glare. Doesn&apos;t do what it says!! Driving at night, cuts down glare. I use the glasses particularly when it is raining, the street lights are bright white or yellow and there is glare on the blacktop roads. Good for cloudy days, and for driving at night. Less glare from oncoming lights. Need to order more of them along with the fold down visors. I use this product specifically for night driving. And it works for me not 100% but it works. I put these glasses on the moment that I received them (which did not take very long)and I have been satisfied with them since their arrival. This product protects my eyes inside and out. It is great for night driving. It cuts down on the glare and is totally clear day or night. I would love to have a smaller frame since I wear them both night and day, inside and outside. They are like regular glasses for me. I do however, have to take them off for reading. I have bought them as gifts for other family members. Great product. driving. decent product. misadvertised though. Thought I was getting two pairs and when I called had to go through a million advertisements. really tacky. They cut the glare from on coming cars greatly. Make night driving much more comfortable. I use the product at night to lessen the glare of lights and also when raining. Noticed a improvement immediately in my vision and what you can see clearly. Helps with the bright morning subshine. I use the product while driving. It does work in low light and inclement weather. These glasses are good for normal glare from regular headlights but are ineffective against HID lights. They are comfortable to wear. I do enjoy them. I would buy another pair.